Flourish. l Enter the Tribunes (including Marcus Andronicus) and Senators aloft. And then enter, Saturninus and his followers at one door, and Bassianus and his followers with Drums, and Trumpets. Renownèd Titus flourishing in arms. Flourish.l They go up into the Senate House. The Tribunes and Senators exit from the upper stage. Sound drums and trumpets, and then enter two of Titus' sons () and then two men bearing a coffin covered with black, then two other sons (), then Titus Andronicus, and then Tamora the Queen of Goths and her sons Chiron and Demetrius, with Aaron the Moor, and others as many as can be, then set down the coffin, and Titus speaks. Hail Rome, victorious in thy mourning weeds! Behold the poor remains alive and dead. A mother's tears in passion for her son. Were piety in thine, it is in these! Exit Titus' sons with Alarbus. Oppose not Scythia to ambitious Rome! And with loud larums welcome them to Rome. Sound trumpets, and lay the coffin in the tomb. In peace and honor rest you here, my sons. Whose fortunes Rome's best citizens applaud. And fame's eternal date, for virtue's praise. 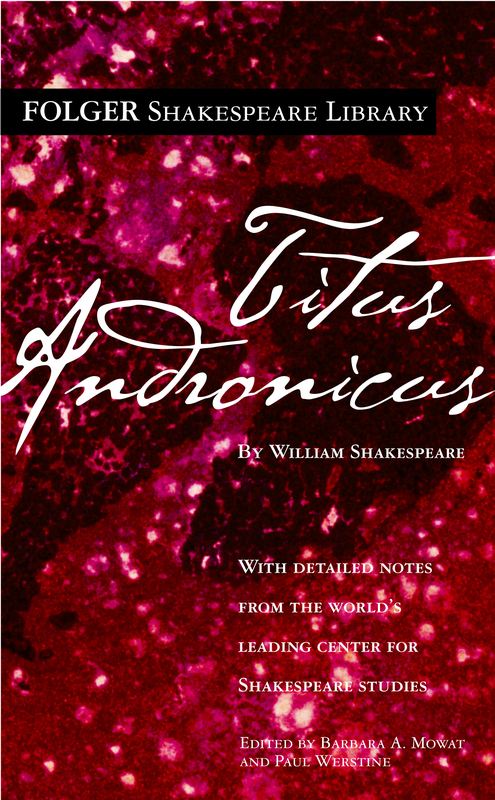 Enter Marcus Andronicus, carrying a white robe. Enter aloft Saturninus, Bassianus, Tribunes, Senators, and Guards. Gracious triumpher in the eyes of Rome. You that survive, and you that sleep in fame. With these our late deceasèd emperor's sons. To Tribunes and Senators aloft. What, should I don this robe and trouble you? Rather than rob me of the people's hearts. The people's hearts and wean them from themselves. But honor thee, and will do till I die. Of noble minds, is honorable meed. Crown him and say "Long live our emperor." And say "Long live our Emperor Saturnine." Presents well worthy Rome's imperious lord. Mine honor's ensigns humbled at thy feet. Will use you nobly, and your followers. Thou com'st not to be made a scorn in Rome. Thanks, sweet Lavinia. -- Romans, let us go. Flourish. Saturninus and his Guards exit, with Drums and Trumpets. Tribunes and Senators exit aloft. How, sir? Are you in earnest then, my lord? Bassianus takes Lavinia by the arm. Suum cuique is our Roman justice. And that he will and shall, if Lucius live! Enter Saturninus and his Guards. Treason, my lord. Lavinia is surprised. My lord, you are unjust, and more than so! and her two sons and Aaron the Moor. That is another's lawful promised love. He exits. Confederates all thus to dishonor me. That said'st I begged the empire at thy hands. To him that flourished for her with his sword. Whose wisdom hath her fortune conquerèd. Dishonored thus and challengèd of wrongs? Enter Marcus and Titus' sons Lucius, Martius, and Quintus. O Titus, see! O, see what thou hast done! Which I have sumptuously reedified. Repose in fame, none basely slain in brawls. My nephew Mutius' deeds do plead for him. "And shall"? What villain was it spake that word? And with these boys mine honor thou hast wounded. My foes I do repute you every one. (Lucius, Martius, and Quintus) kneel. That died in honor and Lavinia's cause. Be barred his entrance here. They put Mutius in the tomb. No man shed tears for noble Mutius. All but Marcus and Titus exit. I know not, Marcus, but I know it is. Flourish. Enter the Emperor Saturninus, Tamora and her two sons, with Aaron the Moor, Drums and Trumpets, at one door. Enter at the other door Bassianus and Lavinia, with Lucius, Martius, and Quintus, and others. Nor wish no less, and so I take my leave. My true betrothèd love and now my wife? Meanwhile am I possessed of that is mine. 'Tis good, sir, you are very short with us. But if we live, we'll be as sharp with you. To be controlled in that he frankly gave. 'Tis thou, and those, that have dishonored me. How I have loved and honored Saturnine. He kneels. rDissemble all your griefs and discontents. Which Rome reputes to be a heinous sin. And fear not, lords -- and you, Lavinia. Marcus, Lavinia, Lucius, Martius, and Quintus kneel. Tend'ring our sister's honor and our own. That on mine honor here do I protest. I will not be denied. Sweetheart, look back.